Butterfly Ballet was commissioned by one of the artist's collectors. 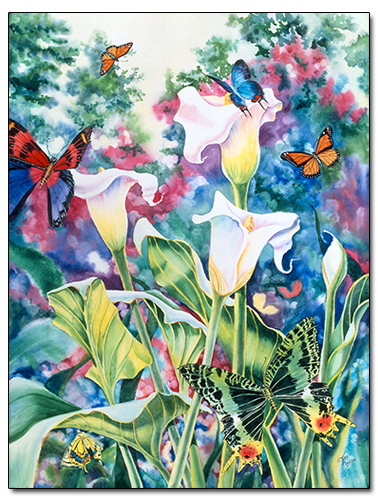 It so happens that this gentleman's wife loves butterflies and calla lilies, so Joan created this watercolor painting as a gift to her from him. The artist notes that the butterflies fluttering around the calla lilies reminded her of ballerinas dancing on stage. This is nature's ballet. The butterflies symbolize new life and new beginnings. Butterfly Ballet has a companion piece, Butterfly Ballet II.